Not so long ago, I had written this post about the present state of Indian Cinema (Click Here to read it). Coming to Telugu Movies in particular, there has been a void for some good cinema for a long time...and finally someone took notice of that! If not a brilliant movie, this week's latest release in Tollywood, Kotha Bangaru Lokam is a honest attempt depicting the life of teenagers, especially the ones who have just stepped into Intermediate. 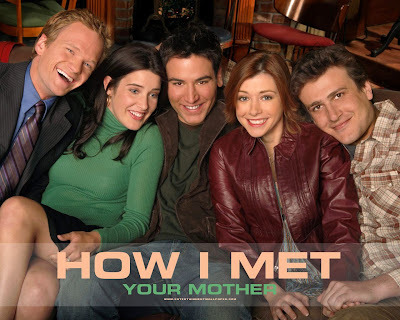 Synopsis: It's the story of a young couple's journey as they try to find out if it's love or attraction that binds them. It's about the decisions that parents take for their children and the little joys of life which make it so special. All in all an endearing love story which will leave a smile on your face. Happy Quizzing and hope atleast some of you drop in at the Theatre fest...they do feature some good ones from time to time! Have you ever laid your hands on a book and wonder if it's "The One" which will change your life?! If you go by the reviews that you find behind the book, then almost 1 out of 3 books claim that this is the best book you can ever come across...but sadly most of them don't live upto the expectations. So, what so different about "The Game"....Yes, it's a book! Written by Neil Strauss, it chronicles his journey which he takes to understand the art of seduction and how pick up artists perform and share their information with others! "The Game- Penetrating the Secret Society of Pick Up Artists"- By Neil Strauss is perhaps one such book which somehow manages to surprise you at every corner. Written in a very casual manner, it's not exactly a gyaan which the writer is giving out to the readers, but the extra-ordinary turn of events which at times sound too good to be true! But who knows...as time has shown us nothing is impossible!! !...The book is about Self-Discovery, believing in oneself and making your presence felt in social gatherings. This is what you would realise the book is about once you get the essence, of course, on top of all this, it's about nerds and geeks realising that they have something special going inside them. It's about people like you and me shedding their deepest fears (of rejection) and inhibitions...with the overall impact depicted when it comes to starting and carrying on a conversation with every blue eyed (or otherwise) girl who interests you! I wouldn't go far and say that, this book will change course of your life, but then it's something which you can't stop raving about once you begin it! Right from the almost surrealistic conversations to discovering what women prefer...from discovering self to what makes you a runaway hit...the book's got it all! It's a must read for all single men...of course, mere reading of this book won't get you laid (or whatever your intent is!) but it definitely ignites a spark in you to start doing something about what you want! P.S: Although, some would say the book is just for men, because all that people seem to be doing is flirting around with girls...but WTF...it's a brilliant book...which anyone can enjoy! Remember, back in 2004 there came a book titled "Five Point Someone" by Chetan Bhagat and it took the Indian publishing industry by storm. What added to the craze was the IIT tag to this book, it was after all marketed as "Five Point Someone- What not to do in an IIT". Oh...boy, Chetan Bhagat and the publishing house did indeed mint money with this book. Oh, just in case if you didn't know this...according to some sources, selling 5000 copies of a book is enough to put in Bestsellers bracket in India! And his book according to some reports in May, 2008 has touched 7 lakh copies! !..and still counting. 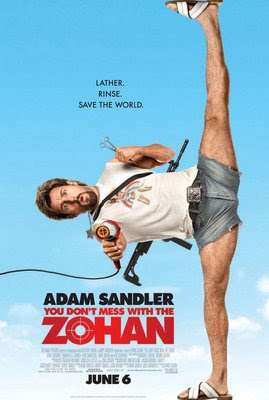 Whatever maybe the case, it proved that you don't have to be a Rushdie to become a star overnight. If I may take a stand on this issue, I would go on to say that this book has given confidence to so many other budding writers who dream of getting their book published. And whatever maybe the case...a book would eventually find its reader. 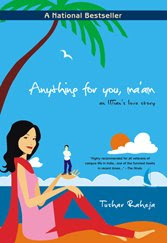 Anything for you Ma'm, is a book written by Tushar Raheja who was a final year student in IIT, Delhi when this book was published back in 2006. The book follows the trail of a IITian named Tejas Narula who's longing to meet his lady love Shreya who's in Chennai. As you would have expected by now, the girl's dad realising that she's in love has grounded her in Chennai. And it's upto Tejas to do whatever it may take to meet his girl.